The Swiftsure class was a class of nuclear-powered fleet submarines in service with the Royal Navy from the early 1970s until 2010. Six boats were built and commissioned. Swiftsure was decommissioned in 1992 due to damage suffered to her pressure hull during trials. 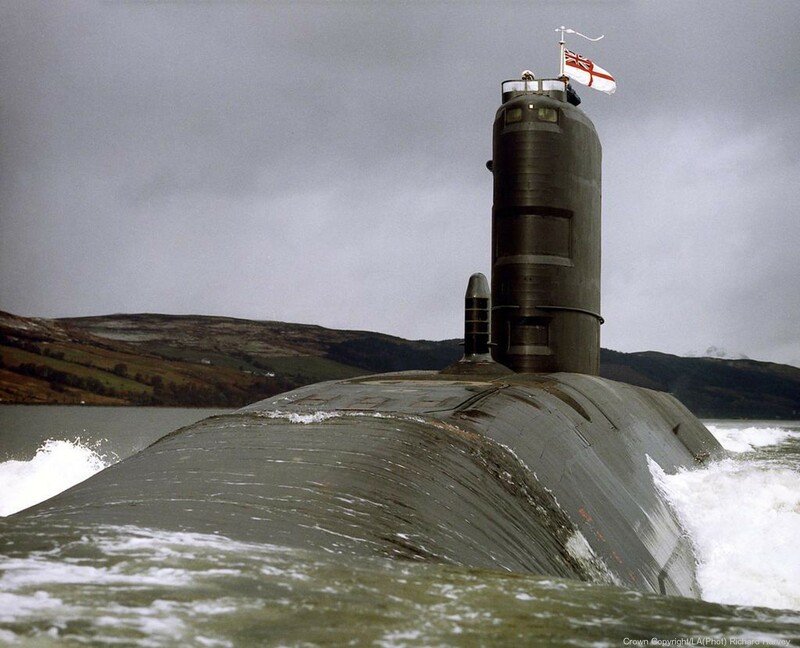 Splendid followed in 2004 after defence cuts caused a reduction in the size of the RN submarine fleet. Spartan was decommissioned in January 2006, with Sovereign following on 12 September 2006. Superb was decommissioned on 26 September 2008. The remaining boat in the class, Sceptre, was decommissioned in December 2010. They are being replaced by the Astute-class submarines. A few were upgraded with the capability to launch Tomahawk cruise missiles in addition to their original armaments of torpedoes, mines and anti-ship missiles. They were also the first class of Royal Navy submarines to be built with shrouded pump-jet propulsors. The Dreadnought, Valiant and Churchill classes all had a "whale-shaped hull", of "near-perfect streamlining giving maximum underwater efficiency". The hulls were of British design, "based on the pioneering work of the US Navy in Skipjack and Albacore." The hull of the Swiftsure was a different shape and maintained its diameter for a much greater length than previous classes. Compared with the Valiants the Swiftsures were 13 feet "shorter with a fuller form, with the fore-planes set further forward, with one less torpedo tube and with a deeper diving depth." A second major change was in propulsion. Rather than the seven/nine-bladed propeller used by the previous classes, all but the first of the Swiftsure-class submarines used a shrouded pump-jet propulsor. The prototype propulsor had powered the Churchill. It is not clear why the Swiftsure was the only one of the class not fitted with a propulsor. The propulsor was perhaps as much as 50% more efficient than a propeller, producing the same speed at lower revolutions, thus reducing the noise signature. In addition all pipework connections to equipment on the main machinery raft had expansion/flexible coupling connections, which also reduced noise. The US Navy secured a licence to copy the main shaft flexible coupling arrangement in US-built submarines. Both Splendid and Spartan were ordered to sail south for the Falkland Islands two days before the Argentine invasion of the islands on March 30, 1982. Spartan was the first ship to arrive in the islands and began to enforce a 200-mile (370-km) maritime exclusion zone imposed by the British. Shortly after, Spartan sighted Argentine merchant shipping mining the harbour at Stanley, but was not ordered to attack. This was partly due to British concerns about escalating the war too early, but also to avoid scaring off more valuable targets such as the Argentine aircraft carrier Veinticinco de Mayo. Unlike HMS Conqueror, neither Spartan nor Splendid fired in anger during the Falklands War, but they did provide valuable reconnaissance to the British Task Force on Argentine aircraft movements and the submarines' presence effectively restricted the freedom of action of the Argentine Navy which spent most of the war confined to port. In the late 1990s, Splendid became the first British ship to be armed with American-built Tomahawk cruise missiles. In 1999 the BBC were allowed on board the boat to record her firing Tomahawks in battle against Yugoslav targets in Belgrade during the Kosovo War, becoming the first British submarine in the conflict to do so. She again fired these weapons against Iraqi targets in the 2003 invasion of Iraq. 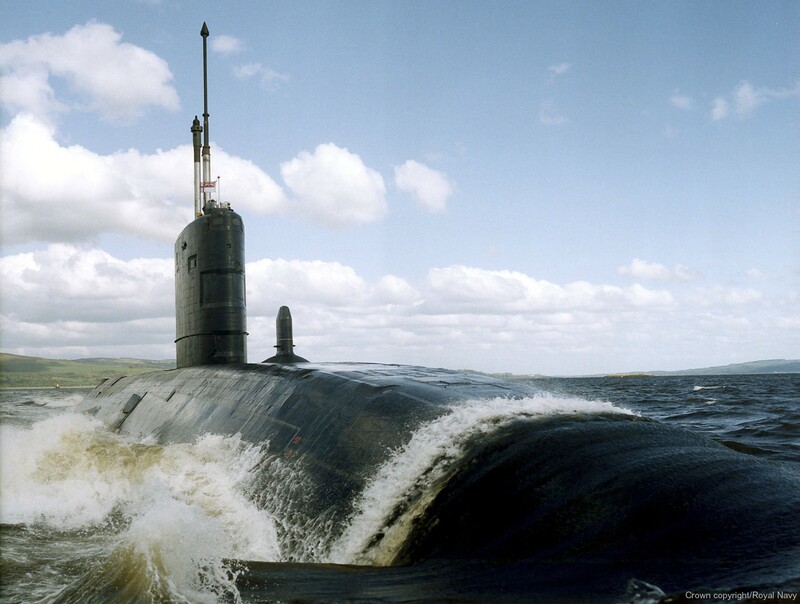 In the early 1980s Sceptre collided with a Soviet submarine and her reactor's protection systems would have performed an automatic emergency shutdown (scrammed the reactor), but her captain ordered the safety mechanisms overridden (battleshort enabled). The crew were told to say that they had hit an iceberg. This incident was disclosed when David Forghan, Sceptre's former weapons officer, gave a television interview which was broadcast on 19 September 1991. The Soviet submarine collided with was probably K-211 of the Delta-III class, which on 23 May 1981 collided with an unknown submarine, identified at the time as an unknown Sturgeon-class American submarine. Sovereign underwent an extensive refit in the mid-1990s and was rededicated in January 1997. 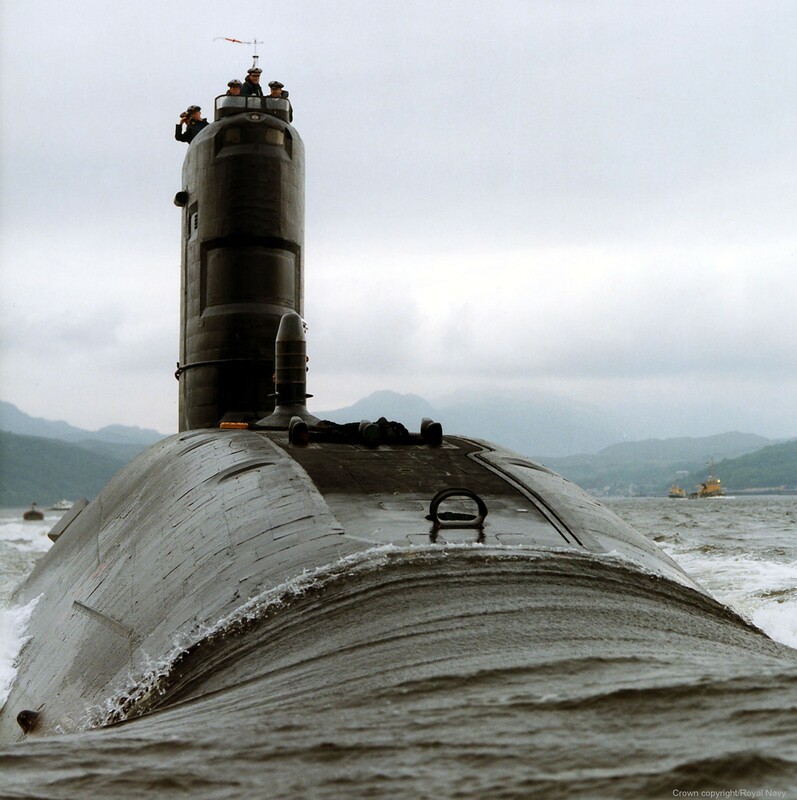 Cracks were discovered in the tailshaft during post-refit sea trials and she was sent to Rosyth for 14 weeks of emergency repairs in June 1998 before returning to Faslane. On 6 March 2000 Sceptre suffered a serious accident while inside a drydock at the Rosyth yards while undergoing trials towards the end of a major refit. The test involved flooding the drydock, and running the main engines slowly with steam supplied from the shore. However, too much steam was used and the engines went to full speed. Sceptre broke her moorings and shot forward off the cradle she rested on. The steam line ruptured, scaffolding buckled, a crane was pushed forward some 15 feet, and the submarine moved forward some 30 feet inside the dock. On 26 May 2008, Superb hit an underwater pinnacle in the Red Sea, 80 miles south of the Suez Canal. She remained watertight, and none of the 112 crew were injured; however, she was unable to resubmerge due to damage to her sonar. After undertaking initial repairs at the Souda Bay NATO base on Crete on 10 June 2008, she passed through the Mediterranean, with a pause (at night) some miles off Gibraltar to disembark some less critical crew. Superb then continued back to the UK, arriving at Devonport Dockyard on 28 June 2008. After surveying the damage, the Royal Navy decided to decommission the Superb slightly ahead of schedule on 26 September 2008.